As many of you know I’ve been working away at my latest and I have to say, my best product I have ever developed called Internet Marketing Explained. Well it is OFFICIALLY LAUNCHED and ready. Thanks for sharing this. I kept on searching and improving my business from increasing traffic and PR. I learned a lot from Michelle MacPhearson, she shares her ideas tips and tools which are so effective that it made an instant difference to my business. Thank you for re-designing the Internet Marketing Explained course. The newer version it’s phenomenal. Thank you for delivering such amazing product. Armand’s IME course has opened doors for me that I never knew existed. This is one course that is worth its weight in gold. If you want to learn about the internet then buy this and become a student. Great Job Armand. Great information and easy to follow. I was lucky enough to be in at the launch and can only say that IME is in class of its own – brilliant. But its not only the course that I love,its the after care that goes with it, so congratulations to your support team as well. I just wanted to say a special thankyou for all the effort and hard work gone into developeing this fantastic product. It was so informative the skils that i have developed from this will continue to better my online bussiness. 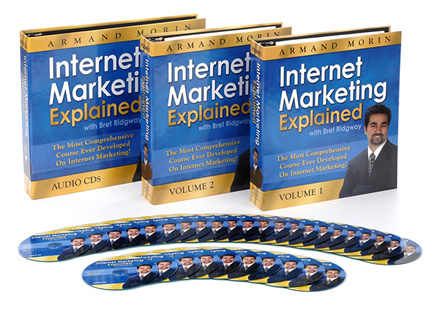 Your product “Internet Marketing Explained” surpass any expectation I had. This is the answer everyone is looking for. Anyone who is not interested is completely missing out. It answered all questions I had.